Mother daughter necklace set of real silver, symbolic of your band! The mother and daughter chains are so special to wear together. Two identical jewelry that symbolize your special relationship. 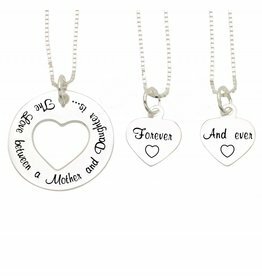 All mother daughter necklaces made of sterling silver, so it remains forever beautiful, as you connctie together. Do you see your little girl already proudly around the room walking with her shimmering 'same-as-mama' chain? More daughters? Order an extra advantage silver necklace! When all the chains you can reorder an advantageous additional children silver chain. Especially for proud mommies more meisjes.Natuurlijk we have thought of grandma, for her order you simply another lady's necklace. What will you shine with this "family kit"! Looking for a gift for your mother? Or your best friend? 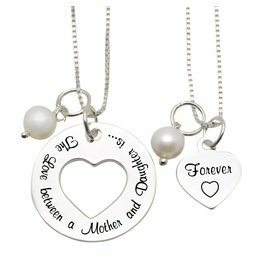 Given the special importance of the jewelry we frequently requested to provide the mother daughter necklaces in two adult sizes. So your mom for example the lock, and you have the key. Of course you can, at no extra cost! 1. Click at age daughter to the oldest age. -that you instead of a children's necklace, like a lady's necklace. -If There is a choice, specify the size ladies chain. Symbolic greeting card for mother and daughter together. The two intertwined hearts say "The love between mother and daughter is forever." Nicely packaged in a red bag, be sure that this gift will hit the spot. Two ornate necklaces for mom and daughter. Both the chain and the charms are .925 silver, forever beautiful. Both chains are a big heart and a small heart processed symbolically for you onlosmakende band. .925 Fine silver chain necklace for mom & daughter. The three hearts in silver and gold-plated rose and gold symbolize your band. The hearts of your daughter fit into yours, how sweet is that ?! 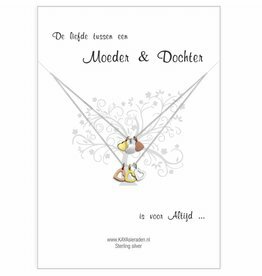 Symbolic greeting card for mother and two daughter together. The two intertwined hearts say "The love between mother and daughter is forever." Nicely packaged in a red bag, be sure that this gift will hit the spot. Gorgeous .925 silver necklaces set with a symbol of Ininity: the symbol of infinite love between two sisters. For now and forever! Luxury finished with 13 sparkling CZ stones. Luxury wrapped, as ready for gift giving. Beautiful set for mother and daughter together. What will you shine with the real pearls, Swarovski crystals. The convex heart symbolizes unconditional love between you. Beautifully wrapped in pink two sides sieradenbuideltje! It remains difficult to find out. The perfect gift Therefore, a KAYA gift that can be spent. 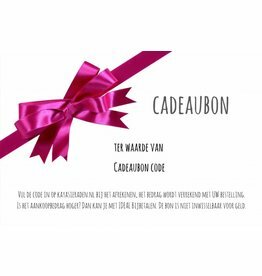 Throughout the shop The voucher is packaged with a small gift. What a sweet onzettend set for mom and daughter, including two chains. To shine together at a special party. Made of through-and-through sterling silver with two shiny beads, forever beautiful. What a sweet onzettend set for mother and daughter, including two chains. To shine together at a special party. Made of through-and-through sterling silver with chubby hearts, forever beautiful. What a sweet onzettend set for mom and two daughter, including three chains. To shine together at a special party. Made of through-and-through sterling silver with three shiny beads, forever beautiful. What a sweet onzettend set for mom and two daughter, including three chains. To shine together at a special party. Made of through-and-through sterling silver, beautiful forever beautiful. 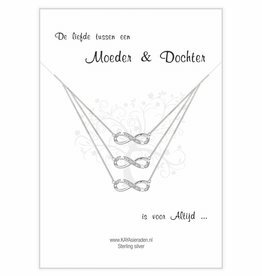 What a sweet onzettend set for mom and daughter, including two silver chains. To radiate together and show that you are always connected to your heart. Made of sterling silver with two shiny beads. The love between mother and son is forever. Beautiful silver necklace to give to the dearest mother. The through-and-through silver pendant is approximately 22 millimeters. Including stunning silver chain. TWo symbolic chain of sterling silver, one for mom and daughter for a sweet (or BFF's, or sisters!). So everyone can show you for eeuig (infinty) love each other. Grave Reen a name, date or a special word.